Walking into Namche Bazaar past shops selling handicrafts and trekking gear. Two treks. One in a quiet season in 2013 at the end of November to December where we didn’t get all the way to Base Camp. But we were hooked on the beautiful Khumbu region and it felt liked unfinished business. So we tried a second time. Despite the Nepalese earthquakes in April and May last year, with our flights already paid for we decided to continue with our proposed trek. So in an even quieter season in late September to mid October 2015 we trekked and we this time we made it to Everest Base Camp and climbed Kala Patthar. And yes, there may be another. 2015 Heading out for Namche Bazaar – with a lighter load we had a porter guide. TIP: Take a porter and use trekking poles they make a huge difference. 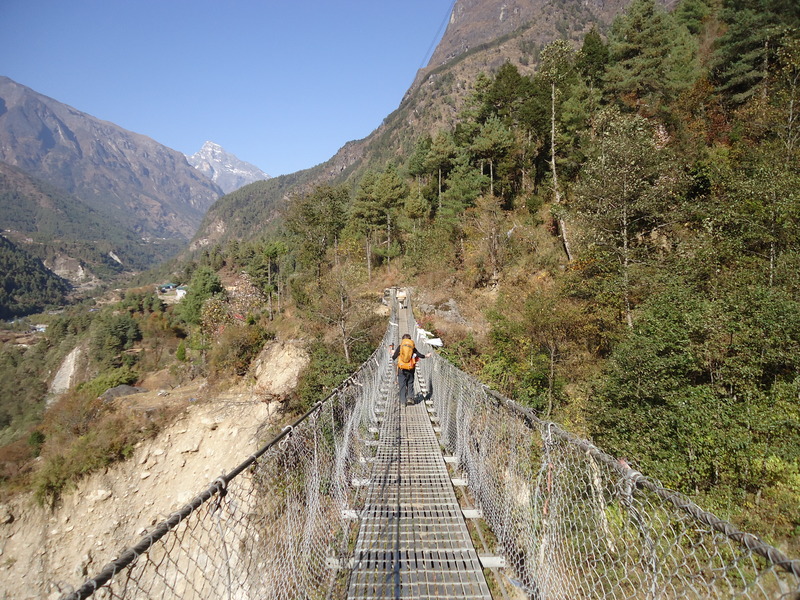 The first bridge in 2013 and the last bridge in 2015 before Gorak Shep and Base Camp.